In my previous post to the resilience reporter I flagged up some common themes. I also gestured towards the use of feedback from resilience-related projects in which I and others from the GRC are engaged. This is an ongoing effort to try and link research with practice in a public commentary on building resilience. It is not enough to be working with a definition. We’ve established that the definition of resilience necessarily changes depending on the point of view from which the concept is approached. This means there are as many types of resilience as there are areas of interest, the definition is one of alignment to the needs of the user. And, I have to be honest here, this also means that there is as much ‘bad’ as there is ‘good’ out there as a result of what we have called the ‘polysemic’ nature of resilience. The term MAY fall out of favour, it may be misused (and in some cases already HAS been misused). Much of the usefulness of the idea in future will depend on which version of resilience, on which trajectory of meaning-making gains ascendency during the roll out of resilience practice in different contexts. To try and flesh this problem out a bit more I will flag up a couple of these issues here. We know that change can be difficult, even painful, in any entrenched system. Too often the political capital to enact sweeping reform is too costly and those tasked with governing dare not take the risk. It may seem easier to protect the status quo and to conduct our governance much as we always have, following the well-trodden path and allowing the inertia born of our momentum to drive us onwards. The thing is, just because something has always been done that way does not mean that the established way of thinking, doing or acting is the best one. Those engaged in the interminable negotiation over project and funding, the grinding cycle of grant or project applications and the conformance culture of evaluation and reporting using the same tools again and again will tell you that as much as these factors ensure a minimum standard of quality at low risk they also stymie innovation and limit the possibilities of what can be achieved by being more adaptive, more flexible. One may understand that such benchmarked practices can be useful in certain circumstance, but as universal rules they create as many problems as they solve. Such tools are rigid and undermine progress towards meaningful resilience. From a more scholarly perspective we might say that the lack of general resilience in the most neoliberal alignments of democracy at fault here – but that is perhaps a discussion for elsewhere. Here and now, in terms of the potential to change our complex systems of governing through resilience thinking and practice, there is so much more we can discuss. Around the world efforts are ongoing to try and incorporate resilience into white papers and strategic frameworks as a means of giving practitioners and politicians alike a point of departure in doing resilience for real; to my mind these too often smack of rhetoric – especially when the fine-grain is pulled back and we look into what the those key players are actually DOING differently, which is too often not much at all. Resilience is more than a rebranding of environmental management, sustainable development, climate mitigation or adaption or any other policy space that has become overly contested or ‘stuck in the mud’. Despite the critics, I do not believe that resilience is being used as an excuse increase the distance between citizens and their representatives, or to pass the buck for dealing with disasters onto citizens. Rights come with responsibilities and that has always been the way in democracy. One can even argue that a greater distance between the professional politician and the citizen is actually useful for the empowerment of local communities – another of the more uncomfortable unresolved tensions in resilience thinking. All the while the main players soldier on, doing good work, not-so-good work and on the odd occasion down-right bad work. One can argue that the most interesting and progressive attempts to build resilience into the way we organise our world are coming from the non-governmental and third sector more generally, and identifying which players are proactively changing the rules of the game is an important feature of documenting the positive possibilities of real world resilience. I will give you a couple of examples, very briefly, of two programmes which have helped seed some interesting changes through the resilience concept. The UNISDR ‘Making Cities Resilient’ campaign is perhaps the biggest programme in the world today and alongside the Rockefeller Foundations ‘100 resilient cities’ campaign these two programs have been driving real change through the milieu of urbanism. Perhaps in both cases it is the appreciation that local context and local people need to be a key driver of developing a resilience strategy for the city that sets them apart from more nationally focussed government discussions, typical of national strategy documents. One might say that this sounds much the same as any white paper on community resilience you might encounter, but there are significant differences in the way such work is being undertaken. Bringing local expertise and knowledge into the fold is not here being championed through entrenched methodologies of lip-service consultations, producing documents for councillors or department heads which never again see the light of day. Here the work of governance is often focussed on the benefit of a more direct form of democratic engagement. 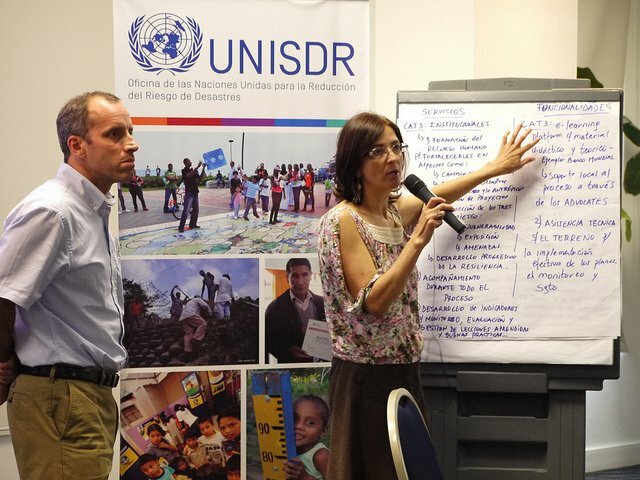 UNISDR work spans the globe, but in Manchester, England has a long history of dealing with disaster events from the IRA bombings to floods and foot and mouth throughout the rollout of Civil Contingencies legislation the North West region has skin in the game of being prepared. A dedicated ‘civil contingencies and resilience unit’ coordinate work with a host of agencies to build resilience across ecological, technological or industrial risks. With these areas of what might be considered traditional disasters well-grounded they are also now looking at the social, economic and other human system based dangers that might be strengthened, including aspects of urban greening, sustainable design and community engagement in these practice to build trust and deepen the connections that underlie a strong and healthy community. This has not gone unacknowledged and Manchester has long since been heralded as a role model for total resilience. The importance of local context cannot be overstressed when looking at resilience. For example the Rockefeller funded resilience team in Porto Allegre, Brazil have a long history in participatory budgeting, using the 100 resilient cities money to enhance and expand on this they have created a strategy that emphasises the lessons learned over time. This creates an evidence base of best practice locally to help coordination of future local projects. It is a local strategy therefore it does not prescribe the way of working in a professional standard, rather creates a case study of the possible which other cities can reflect on. In Bristol in the UK there is strong history of energy and waste efficiency which is now being expanded into a ‘future proofing’ goal to deal with a range of challenges, including social, ecological, economic challenges as well as human well-being and quality of life. Each Rockefeller resilient city engages the funded position of Chief Resilience Officer (CRO) with a nuanced focus relevant to the local context, though the long-term impact of such work remains uncertain it has significantly raised the profile of resilience thinking and many CRO’s have become arbiters of change within their host organisations. Through Rockefeller this has also created a network of CRO’s with annual meetings to help share expertise and build the exchanges of information across these local contexts that facilitate a broader translation of lessons learned into the local contexts of each agent. Most importantly in these examples, taken from two continents, there is a drive amongst those engaged in the work to seek out new ways of governing. Central to this is the need to deepen collaboration with the local population throughout the process, moving from services delivered by experts to services in which the local community have a direct stake and active role. By encouraging a more permeable interface between the vertical hierarchy of expert services and the flattened network of community members information flows much better and trust is built between all participants. In times of stress or shock these relationships are invaluable for increased resilience, but they also facilitate a longer term improvement in the quality of life of all those involved. Beyond the development of a resilience strategy which sits underneath Rockefeller investment there is a drive to leave trails of change in the everyday lives of local inhabitants which change the way in which the locale is governed. This gives those of us advocating change much to think about in exploring the right kind of change and where to best place the lens with which resilient thinking is drawn into clearer focus, thus informing the potential of more resilient practice for the future. Peter Rogers is a Senior Lecturer in the Sociology of Law at Macquarie University. He is the former Co-Director of Climate Futures research centre at Macquarie University and author of two books on urban resilience.